Thinking about the food I will be able to taste plays a huge part in building my excitement for a trip. I am so excited to spend 3 days in Lisbon – the sea-faring capital of Portugal – and indulge in some amazing foods that are hard (or impossible) to come by in Bakersfield. The top priority for meals in Lisbon will be the seafood. I’ve heard about the bacalhau, or salt cod, which is the national food of portugal. In my researching I’ve found so many different ways to prepare and eat bacalhau. 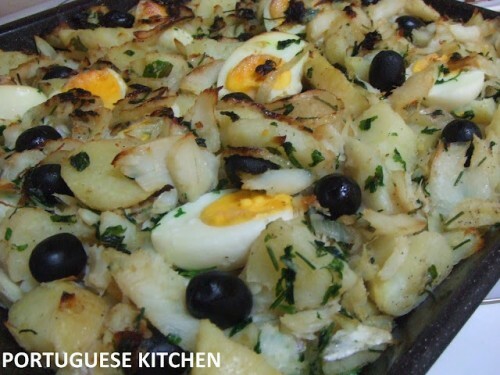 Perhaps we’ll try bacalhau com todos (with everything) or bacalhau à Gomes de Sã (with potatoes and onions, made like a casserole – pictured at the above, from here). Ryan and I are both fairly adventurous when it comes to trying new foods, and one thing we will be seeking out is the barnacles – we love clams, mussels, crab, oysters, and other shell fish, so why not barnacles? 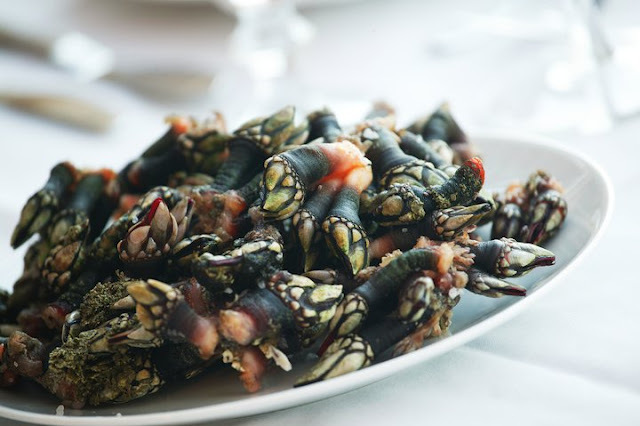 These gooseneck barnacles (called percebes in Portuguese) pictured below look strange, but if we’re presented with an opportunity to try them, we’ll go for it! This picture was found on this blog, where she also talks about other “strange” foods in Portugal. Yum! On some trips we plan ahead and come up with some ideas of restaurants we want to try, but in this case, we are going to trust the owners of Orange 3 House, which is where we’ll be staying. We love getting recommendations from locals to increase the chances of an authentic and successful meal. We’re looking forward to the salted, fresh, and grilled seafood we’ll be able to taste in Lisbon. For something sweet, we are excited to try the Pastéis de Nata. 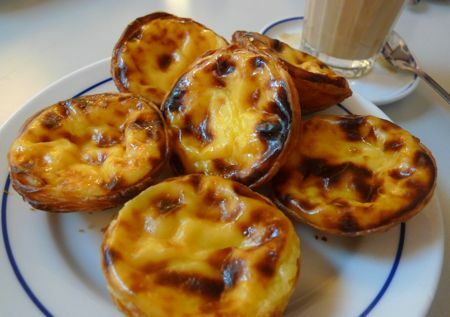 The famous pastry shop in Belém, Pastéis de Belém, began serving these egg yolk custards in the 19th century after the closure of monasteries and convents in Portugal. Since we’re planning on spending time in Belém, we might just make a stop here to try this delectable treat! And finally, to accompany our meals, or for sipping in between meals, we will be exploring the wines of Portugal. Despite having “verde” (green) in the name, Vinho Verde actually means “young wine” and can be white, red, or rosé. I’ve tried a white Vinho Verdo before and found that it was different than other white wines – it almost seemed semi-sparkling. I found out that this is one of the characteristics of Vinho Verde wines, along with being light and fresh. I can’t wait to try more! We also can’t visit Portugal without trying Port. Grapes used to produce this fortified wine are grown in the Douro region in northern Portugal. A great option for trying Port may be the Port Wine Institute, where we can taste a variety of Ports at different price points. For the next couple of months, I’ll be dreaming of the seafood, pastries, and wine we’ll be tasting in Lisbon. Hopefully we’ll have some great food and restaurant recommendations after our trip! This entry was posted in Food, Travel and tagged Europe, food, Portugal, Portugal/Spain 2012 Trip, travel planning by Kristin. Bookmark the permalink. I loved your article and your pics. thank you for sharing. I’d also like to go to Portugal, I love seafood and doing more research on the food there all i have to say is “yumm” but I can’t say if I would try barnacles. Anyway, I hope you had a great trip! Leo, thanks for the comment! We did have a wonderful trip and plan to go back and visit more than just Lisbon. If you are feeling adventurous and enjoy seafood, you should definitely try the barnacles. They were interesting to look at, but delicious to eat!